All aspects of earthmovin­g. Over 20 years in buisness. No job impossible with DIGGER DAVE. Let my experience help you. Free, friendly advice. Digging, excavation­, footings, post-hole boring, retaining walls, section clearing, tipping, trenching, bob-cat work, truck hire, house demolition­. All Auckland area. Outside area by negotiatio­n. Available anytime 7 days a week. Tight access, down to 1 metre wide. We had Dave and King on site for two days work to demolish an old deck, prepare the site for a new deck (post hole drilling, trenching for retaining etc) and scrape to a grade where paths would be placed. They worked tirelessly and performed all work to a high standard with great 'can do' attitude. Recommended and would use again !! we employed Dave to dig out our driveway. The job went along without a hitch. I highly recommend Dave. Very committed. Pricing was fair. Dave's suggestions and advice along the way were genuinely helpful, and we certainly benefited from his skill and experience. Thanks Dave, your a scholar and a gentleman! Dave has been amazing, his friendly advice has been a life saver. Is on time to work, has a solution to every problem and his experience and his attitude towards the job are his greatest assets. 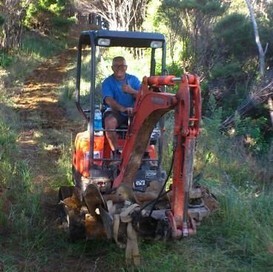 Digger Dave came 3 times to do our garden earth works in Ellerslie. Difficult job with rocks. Dave was always good humoured, affordable, reasonable and helpful. Not only will I recommend Dave to anyone who has got a project requiring any earthworks, but I will use his services again myself. Dave...Thanks for everything. You have made this project possible and you went the extra mile for us. 5 Stars !!!!! Dave is a very experienced operator- Fantastic at his job. He is also a very nice guy who I would highly to recommend to any one. His pricing is very competitive as well. Try him I'm sure you will be glad you did. Dave is an absolute professional, his skills are some of the best out there. i had an under house excavation job and his experience and equipment made the job very easy. there was nothing he couldn't do, and advised on the best way to do the work. probably the cheapest guy around to. i will definitely use him again. thanks Dave. Dave is very efficient, friendly and reliable and reasonably priced - highly recommend. Will use him again. Digger Dave is the best darn digger driver called Dave in the world. Lovely job at Piha, on time, on budget. Top man. We had Dave remove a concrete path, wall and a hedge. There was lots of volcanic rock to remove too which provided a challenge at times. Dave did a fantastic job and despite there being a bit more rock and concrete than he first thought he came in pretty much on quote and time. Definitely recommend using Dave. Top man. Cheers. I highly recommend Dave. Came and gave a price within a day. Job started and finished exactly when he said it would. Excellent, efficient and unlike most contractors he was fussy to ensure site was left very tidy. Dave is likeable ,friendly and great to deal with. I certainly will recommend Digger Dave to anyone. John. Dave did a great job and is a good honest down to earth bloke. He was extra helpful in suggesting ways too keep the cost of the job at a manageable level. I would have no hesitation in recommending him for your next job!